Is the Inhaled-Insulin Afrezza the Real Deal? Afrezza comes in two cartridge sizes right now, equivalent to four units and eight units of inject rapid-acting insulin. It was recently announced that a 12-unit cartridge would become available in late 2015, for anyone who may require larger doses of insulin. The small inhaler device is usable for 15-days, after which it should be replaced with a new inhaler. Afrezza peaks in just 12-15 minutes, making it much faster than current rapid-acting insulins (Humalog, Novolog, and Apidra) that generally take about 45-90 minutes to peak. Afrezza does have minor respiratory side effects – in its phase 3 clinical trials, 20-30% of those on Afrezza experienced a cough, compared to none of the participants on Novolog. So before starting on Afrezza, a lung function test (spirometry) is required. Patients also can’t use Afrezza if they have chronic lung problems, such as asthma or COPD. 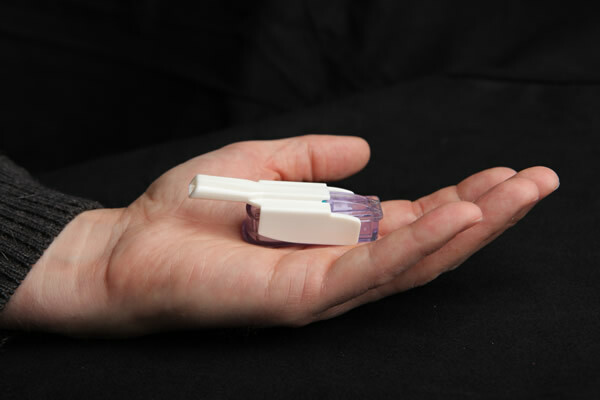 Given the dosing size, Afrezza may be best suited for: patients with type 2 diabetes, an ultra-fast correction dose in type 1 patients, or for very large meals. ALEX: Could you please briefly introduce yourselves? BILL (T2): I have a personal connection with diabetes because I have type 2. I got involved with Afrezza through its clinical trials. I was asked if I’d be interested in a trial involving inhaled insulin, and felt like I could learn a lot about my diabetes and treatment from it. I was particularly excited about the potential of a product where you inhale instead of inject insulin. There are quite a few people, there’s even a name for us who have a fear of needles [needlephobic], so I thought it was a great idea. In the trial I learned not only that it was a great idea but also an effective product. It had beneficial effects for me in lowering my blood sugar levels. After that, I came back to Dallas and discussed with my doctor, who had no real information about it or how to prescribe it. But he’s a really good doctor, and once he gave me a prescription, I filled it, and have been using it since. ANA (T1): I’m 28, I’m in Dallas, and I got involved with Afrezza through my doctor. Since going back on it after the clinical trials, it’s been close to a month now and I’m already noticing the effects of Afrezza and how much better it’s been able to control my diabetes. I have type 1 diabetes, so I rely on injected insulin and have had to switch between different long-acting insulins because of my insurance and other reasons. Afrezza has been a very good supplement with that. Although Lantus worked for me well, Afrezza was able to bring down my blood sugar levels. It was an adjustment getting back on it from the trial, but it was all worth it. There’s a huge payoff as opposed to injected insulin. ALEX: While the exact value of course varies each meal, in your experience how does a 4-unit cartridge of Afrezza typically change your blood sugar levels? BILL (T2): Since I got Afrezza in February, I started checking my blood sugar regularly and have been recording on a notepad. It’s hard to say exactly because there’s so much arithmetic between the time of day, the number of carbs eaten, and how soon before you eat you take Afrezza, but from a general point if I take it right before I eat then my levels don’t go up that high. Instead of hitting 225 mg/dl I may only jump to 145 mg/dl. ANA (T1): It really does depend on where you start, and there’s a lot of arithmetic involved. If I had to guess, Afrezza decreases my blood glucose levels about 50 mg/dl less than where I started. Two hours post-meal it brings it down to a good level around 100 to 120 [mg/dl]. My injected insulin was nowhere near that. ALEX: Have you seen any effects of Afrezza on hypoglycemia? BILL (T2): I set a good lower limit of 70 mg/dl on my CGM and I’ve never had any hypoglycemic issues. I’m lower than I used to be and that’s a good thing, but it’s a little different because I’m used to having higher blood sugar. ANA (T1): It’s definitely helped with the hyperglycemia. Sometimes I’ll have low blood sugars with Afrezza, but it’s not as extreme – it’s not in the 50’s [mg/dl] anymore. With Afrezza, the lowest I’ve seen is 68 mg/dl or somewhere in the 70s, and it's not as frequent. SALLY: What has surprised you guys most about using Afrezza? BILL (T2): There were no significant surprises. I’ve been impressed at how quickly it works. If I take it at the right time then I can keep my blood sugars at a pretty normal range. My goal with Afrezza is to maintain an A1c that is a normal person’s A1c and it looks like I may be able to do that. ANA (T2): How quickly it acts compared to my Humalog. It’s so much easier and it has fewer materials and supplies associated with it. I love that it comes in a pack of 3: breakfast, lunch and dinner. When I don’t use it for breakfast I can just throw it in my purse. And I like how fast it acts, so I can take it right before a meal. Before with Humalog, I would have to calculate doses and inject five to ten minutes before I eat. But now I can eat it with the food right in front of me. SALLY: What’s the most challenging part of using Afrezza? BILL (T2): My experience is a little different. I was not on a fast-acting insulin before. After the Afrezza trial, my A1c went up higher than it was when I was in the trial, which indicated to me that I wasn’t on the placebo during the trial. My doctor prescribed Lantus to me to begin trying to control my diabetes better. I did that until the Afrezza was available. Once it was, I went back and started using Afrezza. It really has helped me a lot with mealtime spikes. I’ve since gotten a continuous glucose monitor and it’s extremely easy for me. I didn’t switch from one fast-acting insulin to another - I just added Afrezza as a type 2, and only where I needed it. ANA (T1): Adjusting to a different insulin is a little hard. Because I’m inhaling it, there’s a little bit of coughing, but it didn’t last as long this time as in clinical trials. For me, it was just the dosing and counting different carbs. Other than that it was pretty easy. SALLY: If you could make one improvement to Afrezza what would it be? BILL (T2): I don’t know what I would do at this point in time to correct it. I’ve found the inhaler to be extremely discreet, small, and well functioning. I don’t have any issues with it. When I first started back on Afrezza I had a small urge to cough, but I resisted because I wanted to retain the insulin. That was extremely minor, and it has essentially just disappeared. ANA (T1): I think the inhaler. It was different from the one in the trial. We had a reusable inhaler that we cleaned and maintained. But this disposable one is smaller, and there are a certainly a lot of benefits to the one we’re using now too. The coughing is less, for example. Many of the things that were negative about it before are resolved this time around. I do wish, though, that it were something that I could reuse still and not have to get a separate prescription for the inhaler and the cartridges. ALEX: Other than the minor coughing issues, have there been any other side effects with Afrezza? BILL (T2): No side effects for me. ANA (T1): Not for me other than the coughing, which was very minor. ALEX: Do you expect to use the new 12-unit cartridge in your management? BILL (T2): I think I can use just the 4 and 8 without much problem. You develop a habit of trying to keep your carbs under control as you manage them with the 4 and 8. There might be times, if I’m going to a wedding or a big holiday dinner, where it might be nice to have a 12. I know a gentleman also on Afrezza, and his blood sugar is so high he takes two or three 8 unit doses at a time. I know from his experience that a 12 unit dose would be very convenient. There is a need for a 12, and there could occasionally be a need for a 12 for me. ANA (T1): Personally no, not me. I don’t eat enough and I don’t anticipate using the 12. If I’m high going into the meal and want to eat a heavier meal, then I might use the 8, but definitely not the 12. ALEX: How would you describe the ideal person to take Afrezza? BILL (T2): Anyone with diabetes could benefit from Afrezza. If you have high blood sugar, in my experience this is the easiest way for you to control it. ANA (T1): Someone who eats three regular meals per day. It might not be for people on diets with smaller meals, or people who eat more meals per day. It’s do-able, but you have to figure out a routine and stick with it. For more information on Afrezza, please see our past coverage here.